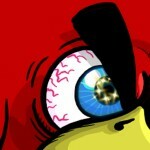 Below is our walkthrough video for Angry Birds Rio Treasure Hunt Star Bonus Level #3. The level is unlocked by earning 110 stars in Treasure Hunt. How come it’s so difficult to find videos of the bonus stages in angry birds? When you get to the star levels, it’s so hard to find video help. Each stage has a number that helps to find videos, but bonus level don’t. Maybe it’s just me, who knows? I wish each level had a video link for help. I find my way to the walkthroughs by going to my leaderboard, and click through, first to the standings for a level, then onto the walkthrough. Same as walkthrough video, but got a little lucky when everything on the middle deck of the boat fell. A couple crates left elsewhere so this score can be beat. same as video with some luck. also believe a 1 birder and more points possible, with a lot of luck and patience. I scored, 148,830. Caution, the shot is easily reproducible time after time, unfortunately, the results are not. Send Terrance down and under water. You want him to come up through the two ice sheets and impact the structure holding the small TNT. You want the TNT to get pushed up and detonate on the ceiling above it. This can set the large TNT loose. A chain reaction one birder is possible, but rare. Zoom in and find a good background marker to reproduce the shot time after time.